Meat and threes may be dwindling in Georgia, but we’ve found some spots that still serve plenty of personality with their sweet tea. 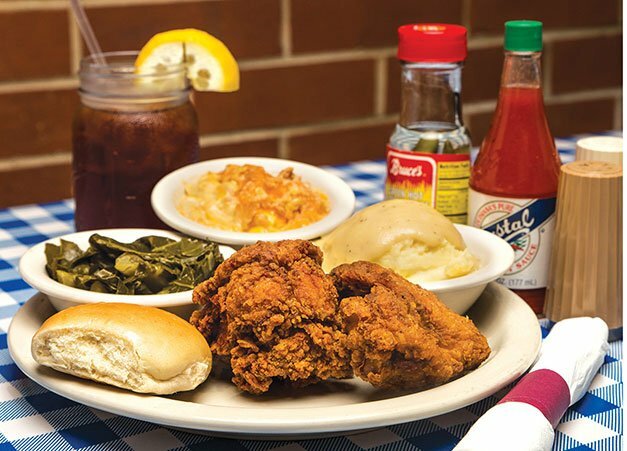 Comfort Food: H&H’s classic fried chicken and veggies in Macon. When I first started writing about restaurants years ago, I was often scouring the ’burbs and hamlets for offbeat finds – the neighborhood Italian place with panna cotta or braciole; the esoteric but destination-worthy ethnic spot; and perhaps my favorite, great meat-and-threes. Many of these Georgia treasures, named for the custom of ordering your choice of meat and three sides for one price, have gone the way of public pay phones and customer service. Who could forget Atlanta’s Deacon Burton’s, either for his fried chicken and hoecakes or for his habit of halting the lunch rush to ring his little bell and lead a prayer? More recently, Carver’s Country Kitchen, also in Atlanta, closed its doors, depriving us of the Dolly Parton chicken breasts and pan-fried corn forevermore. Yes, some old soldiers carry on – The Busy Bee on Atlanta’s West Side (dear Lord, the ham hock!) and Athens’ Weaver D’s leap to mind. And three I encountered recently give me heart: Macon’s H&H Restaurant, with new owners preserving the storied tradition of Mama Louise; J’s Simply Soul, a recent venture from Detroit natives in tiny White, Ga.; and Dillard’s Cupboard Cafe, serving tourists and locals since 1990. All meet my personal meat-and-three genre-defining requirements: Table service (as opposed to cafeteria-style), with solid plates and metal flatware, daily specials, lots of vegetables, and fried chicken as the tentpole (as opposed to barbecue – sorry, Southern Soul). And as much as I enjoy the eye-widening Old Fashioneds at The Colonnade, to my mind, the purest meat-and-three doesn’t serve alcohol. Its most potent potable is brewed iced tea, sweet and “unsweet.” (But we still love you, Mary Mac’s, and Paschal’s too.) Nor is it all-you-can-eat (with a respectful nod to Buckner’s and Mrs. Wilkes’). Nope, it’s a single meal. Most importantly, however, a meat-and-three should have a personality – or soul, if you will – conveyed by its servers, as proudly as the plates they carry to your table. H&H: If you’ve never heard of H&H or its matriarch “Mama” Louise Hudson, you’ve never heard of The Allman Brothers Band, Chuck Leavell or maybe even Macon. Since 1959, Hudson has done more than cook up soul food – she nourished the city’s music scene, starting from the time she spotted some broke, skinny white guys sharing one plate of food and brought them more, telling them to pay her back when they could. Eventually, she would accompany the Allman Brothers on tour. After her co-owner, Mama Hill, passed away, H&H’s closed in 2013. Enter The Moonhanger Group, which manages Macon restaurant standouts like the Rookery and its fine-dining upstairs neighbor, Dovetail. After some spiffing up, the new owners reopened the H&H last year, pledging to keep Hudson’s food and spirit intact – and she still sometimes sits in to check on things. New chef Keith Steele, however, does the heavy lifting – the fried chicken (offered every day, along with meatloaf) is delectable, as is thick-crusted fried okra, perhaps the best I’ve ever had, along with deviled eggs, fabulous collards, potato salad and steamed cabbage. The iced tea is served in Ball jars, and the baked chicken and dressing comes with little packets of Ocean Spray cranberry sauce. Desserts are simple – caramel cake, or bread or banana pudding. J’s Simply Soul: Yes, there is barbecue (pulled chicken and pork, ribs, brisket, Brunswick stew) – the meats slow-smoked on the old-fashioned oil-drum cookers out back and served with housemade sauce. But it’s just a part of the Wednesday night church supper-style spread in this tiny restaurant, almost certainly cooked and brought to you by one of the Warren family, Detroit natives who moved to Atlanta in 2008. Along with everyone else who struggled after the economy tanked, Jerome and Michelle Warren looked for new ways to get by. Jerome began selling his barbecue at a gas station on a busy intersection in northwest Georgia, pulling his smoker into the lot on a trailer behind his van. Soon, he was making more in once-a-week barbecue sales than at his full-time job. A regular customer encouraged him to open a bricks-and-mortar location and led him to the building they now occupy, starting in June of last year. “That was all God that allowed that to happen,” Jerome says. Now he, Michelle (who cooks many of the vegetables and some desserts) and son Chantas serve up authentic Southern favorites, learned in part from Jerome’s Mississippi-born grandmother, four days a week. The fried chicken (available Fridays and Saturdays only) is worth the 15-minute wait as it’s made fresh, and the array of vegetables (greens, pole and pinto beans, black-eyed peas, cornbread dressing, mashed potatoes with cheese and scallions, candied yams, mac-and-cheese) reside in a steam table, the glass front labeled like Baskin-Robbins flavors. And yes, just as in the ice cream shop, you get free tastes of almost everything on the menu. On top, glass domes house homemade cakes and pies like red velvet and coconut; the banana pudding is the real deal, topped with expertly browned meringue. Lunch and dinner Wednesdays-Saturdays; a drive-in window for your convenience. Cupboard Café: Like many tourist-town restaurants, the Cupboard Café mixes in a little good-humored hucksterism with its homemade Southern specialties – you walk through the souvenir shop on your way into and out of the restaurant, and you can’t fail to notice the big display cases of pies, cakes and dessert as you wait to be seated in the large dining room. But that’s just part of the fun, and the waitstaff seems to know it, happily mugging for photos and joking with newbies. The enormous menu offers daily specials like chicken and dumplings, pot roast and corned beef, along with all-day, every day dishes like trout, meatloaf, pulled pork, liver (chicken or beef), tilapia and hamburger steak, and a long list of sides like hand-cut fries (sweet or white), rice and gravy or fried okra. The food may not be the most brilliant you’ve ever had, but it can be comforting when you’re on the road, the waitstaff is especially sweet, and there is certainly something for everyone. “Mr. Yummy’s” fried chicken comes in a variety of options, including an eight-piece bucket, but you can go high-end with a Delmonico steak, prime rib or chicken Marsala. Recent additions include Mexican specialties like burritos and fajitas – even the breakfast menu offers scrambled eggs in a tortilla with pico de gallo. And you have to love a “country” restaurant that pours espresso and cappuccino. Open daily except Tuesday for breakfast, lunch and dinner. 7388 Highway 441 N, Dillard.